A sophisticated and high value look, single page website design was required for this business launch. 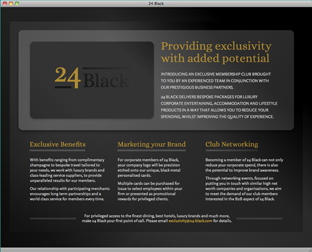 A loyalty club offering discounted corporate entertaining for brokers in the City of London. The design concept for the card itself; to be cut from black metal and etched with the 24Black logo.